Porcelain Veneers are one of the most natural looking cosmetic dentistry options available today. With little or no removal of natural tooth structure we can effectively and beautifully correct and enhance your smile. Whether you have stained or discolored teeth, crooked teeth, cracked or chipped teeth, or misaligned and unattractive teeth, veneers are an easy and more permanent solution to completely improve your smile. Veneers are made of either porcelain or composite resins. Composite resins are applied directly to the teeth, and then shaped appropriately. The porcelain alternative is a thin hard shell that must be constructed in a lab before being bonded over the tooth. Composite veneers are typically less expensive than their porcelain counter-parts, but they have a shorter life span. Composite resin restorations last between five and seven years, whereas porcelain typically last well over 15 years. Unlike bonding procedures used for small problems, most veneers require a slight tooth reduction prior to placement. This means that the thickness of your teeth must be slightly reduced to provide enough room for the veneer but this is a small compensation to beautifully restore your natural looking smile. 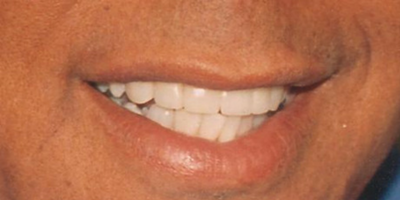 Call Dr. Krimsky today to discuss whether or not veneers are the proper option for your teeth.